Vibrant red pomegranate contrasts with fresh splashes of green parsley in this quinoa salad with a bright citrus dressing. Cook quinoa with water and salt according to package directions, or by adding 2 cups water and simmering in a covered saucepan for 20 minutes. Let cooked quinoa cool. Meanwhile, whisk together ingredients for dressing in a small bowl. 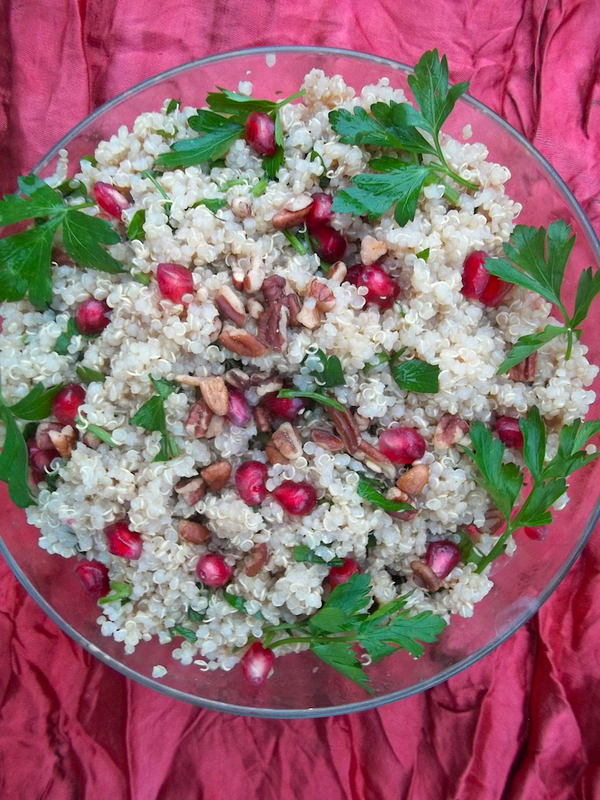 Pour dressing over quinoa and toss with pomegranate, parsley, and nuts. Add more salt to taste if necessary. Serve chilled or at room temperature. I’m sharing this recipe at Allergy Free Wednesdays, Savoring Saturdays and here. What a beautiful quinoa salad! The pomegranate seeds look like a wonderful addition. This looks delicious Thanks for linking at Pintastic Pinteresting party.